90 Day Challenge: Day 1 | Kay Rice, M.Ed. Yesterday I was up by 6:00 am with the first challenge of the day, taking that evaluation of where I am right now, my selfie and my measurements. The first thing I did for my plan was to record my beginning weight and measurements. Really, I hated taking the selfies, but I did it. I even took a close up of my face, because I think there may be a pretty dramatic change there after 30 or 90 days, and I want to compare. The night before I left myself a note by the bed along with a pen, the paper on which to record my numbers, and a tape measure. I also track some of my numbers with an app on my phone, so I made certain I weighed on my Apria Scale so my Fitbit program has a record. Remember one of the things I had to reconcile myself to was a commitment to give up the organic raw honey and half & half in my morning coffee? Well … I tried using Coconut Creme the morning before because I was already out of half & half. I hated it. In fact, I didn’t even finish my coffee. Hmmmm … made me think, “Do I really like the coffee, or is it what I’ve been putting in it that I crave in the mornings?” Well this morning I tried some of TJ’s reduced fat coconut milk (comes in a can, just like the coconut creme) … it was better, but not great. 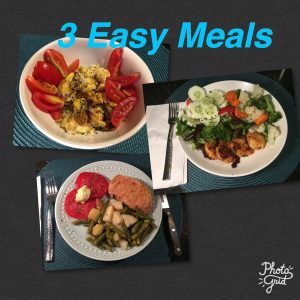 3 Simple, Easy & Satisfying Meals in a Flash! 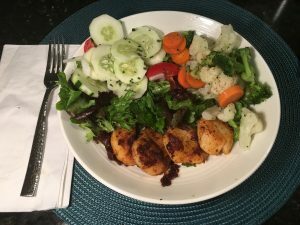 All these meals were created in under 10 minutes … and only the hash browns and the seared scallops took that long. 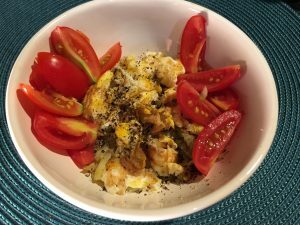 Easy Breakfast Bowl of Hash Browns, Scrambled eggs with tomatoes. To start my day I grated a small potato I got from the farm last week. I sauteed it in a little bit of ghee to make hash browns, then added in one whole egg & two egg whites. Thinking I needed a few more carbohydrates with this meal, I added some of the delicious grape tomatoes I picked up at the local farmer’s market last Saturday. Shortly after breakfast it was off to the acupuncturist! I have a little challenge to share. Early last week I began my day with a few minutes of Yoga followed by sitting in the floor Indian style for 20 minutes of meditation. Nothing strenuous, and sitting Indian style is very comfortable for me. 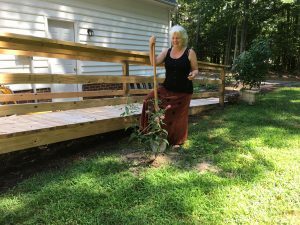 But something in my left hip felt a little off, and then when I went to get up … something in my right knee felt like it got all tangled up, and suddenly I was in so much pain that I could barely get myself up off the floor! I gnarled something up in my knee something fierce! I’ve been using RICE (Rest-Ice-Compression-Elevation) since, at least as much as I can. Thank goodness I have a friend who had a knee brace to loan me! This is a pretty big set-back (to me) in my 90 Day challenge, because it means my exercise is very limited to nearly impossible right now. Heck, I can’t go on a hike or even for a walk around the neighborhood right now. It’s going to take some time and some patience for this to heal. MOST every day seems a little bit better than the day before, but I am still extremely limited in how much moving I can do. Remember, a BIG Part of this 90 Day Challenge is Self Care! Right now is the time for me to practice acceptance, and pay attention to my body and what it needs. I need to rest and baby this knee, I’m going to focus on what I CAN do rather than what I CAN’T. There are still some exercises I can do, and as my knee begins to heal, there are some specific exercises I can do to stretch and strengthen the surrounding muscles that are involved. I can also do some upper body work and stretching. I’m still in “recovery mode”. One year ago I moved here to care for my mother. It completely changed the trajectory of my life for almost a year. There were no other family members to do this job or even help. My body has not fully recovered from the stress of caring for someone 24/7 for an extended time, the lack of sleep, being isolated, and from being confined to the house while she was confined to a bed, not to mention a difficult dynamic with my mother throughout my life. Signs of stress: I gained weight and I’m clearly showing signs of inflammation in my body with my achy wrists, my hip … and there are other signs. 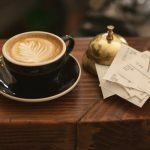 The health consequences due to the stresses of being a caregiver is well documented, and it was emphasized to me during the time I was caring for my mother, that I needed to do my best to take care of myself. The Hospice Team stressed, “You have to do whatever you can to take care of yourself. If you go down, the entire team goes down, because if you can’t be here 24/7 for your mother, she can’t stay in her home.” Dr. Christine Northrop in her book, Goddesses Never Age mentioned that daughters who are caregivers for parents frequently develop auto-immune diseases after the care giving. Right now, I’m going to use all the health, stress management, and self-care tools I’ve learned to regain my health and vibrant energy. Anyway … on to lunch! Notice that I am making certain I have some of every macro-nutrient at every meal. My protein servings are small, generally around 3.5 to 4 ounces, or about the size of the palm of my hand or a deck of cards. I add some fat, and then vegetables provide the carbohydrates. Since I’m not eating grains or legumes, I get to eat a substantial amount of vegetables and some fruit. 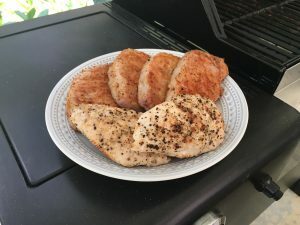 Last week I “cooked in bulk” several pork chops and a couple of chicken breasts on the grill. 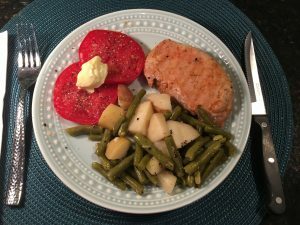 This was the last of those pork chops and some of locally grown green beans and potatoes I picked up a few days ago. These pared with a delicious home grown tomato with a dollop of mayonnaise I made using Olive Oil. Here’s my Quick & Easy Mayonnaise Recipe. 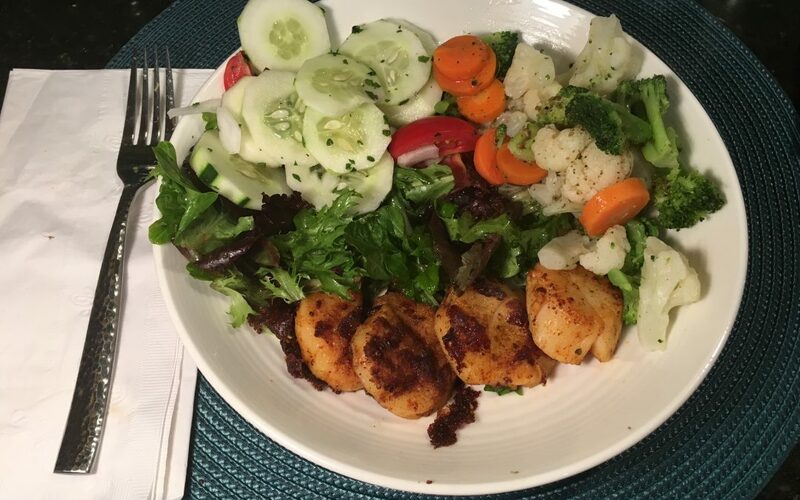 Meal #3: Early Dinner of Seared Scallops & lotsa Veggies! 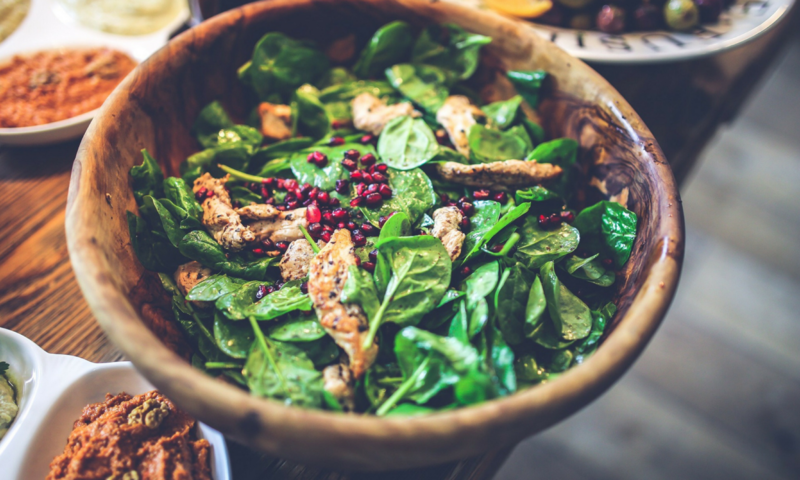 By the way, I have a discount code for you if you order from Primal Kitchen. Just enter GROK15 when you check out for a 15% discount on your entire purchase. I ordered the Whole30 Kit which has a variety of their products for $44.95 (before your discount), plus shipping. Primal Kitchen’s Whole 30 Kit is also available through Amazon Prime for $56.95. 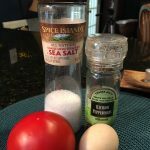 That left one more meal in my day before bedtime … and frankly, I wasn’t all that hungry, so I just had a boiled egg and a tomato with some salt & pepper. Still, that covered all three macro nutrient groups: Fat from the Egg Yolk, protein from the egg white (although normally I’d have some extra egg white to be enough), and the tomato provided carbohydrates. Well, it wasn’t “perfect” but I did my best. Amazon also delivered my liquid vitamin, so I took those, and I met my target for water of the day. If you have questions, comments or have something to share, please comment below. Love the food posts, I am traveling this road with you again. I did have problems giving up sugar sweeteners with my coffee but found after 3 days it was good again and I now use a protein shake for my creamer EAS AdvantEDGE carb control vanilla flavor, I can’t even drink my coffee the way I used to make it!!! Helps me get a little more protein in me as well. Sorry about the knee! I could not tell the protein in Nutpods, can you post a picture of the food label on this? Thanks for the new ideas to try.